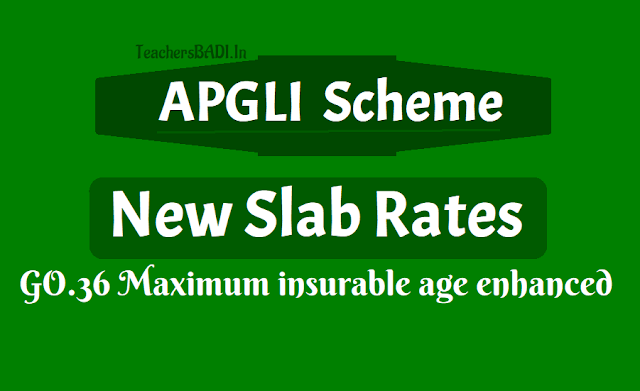 APGLI New Rates, APGLI Scheme details, Existing slab rates in RPS 2010, Revised/new slab rates in RPS 2015, GO.36 APGLI New Slab Rates, Download APGLI New Slab Rates GO.36, APGLI New Monthly premiums, APGLI Deductions, APGLI Enhanced Deductions, Eligible for Enhancement of APGLI Premium: GO.Ms.No.36 Dated: 05-03-2016: Govt of Andhra Pradesh, Public Services, Andhra Pradesh Government Life Insurance Scheme - Endowment Policies - Enhancement of Age of superannuation from 58 to 60 years and introduction of AP Revised Scales of Pay 2015. Enhancement of Maximum Insurable Age under AP Government Life Insurance Scheme from (53) years to (55) years and Revision of Rates of Compulsory Premium with reference to Revised Pay Scales, 2015. 8. G.O.Ms.No.46, Finance (HRM.V-PC) Department, dt:30-04- 2015. 2. In the reference 2nd cited, the Government enhanced the age of superannuation of the State Government employees from (58) years to (60) years. 3 In the G.O. eighth read above, the Government has issued orders introducing the Revised Scales of Pay 2015. 4. Consequent to enhancement of age of superannuation from (58) years to (60) years and introduction of the Revised Scales of Pay, 2015, the Director of Insurance, in his letter 3rd cited, has sent proposals for enhancement of the maximum Insurable age from 53 years to 55 years and to revise the rates of compulsory premium based on the Revised Scales applicable to various categories of employees. The Government in the memo fourth read above, permitted the Director of Insurance to take necessary further action and submit detailed proposals after consulting the Actuary and the Accountant General, A&E, Andhra Pradesh. 5. Accordingly, the Director of Insurance has submitted necessary proposal in his letter ninth read above. 7) (a) All the employees shall increase their premium as per the revised rates specified above and submit requisite 'Proposal Form', after recovery of first premium from the salary at the revised rates and take an Insurance Policy from the Insurance Department. (b) Unless proposal form is submitted and policies are obtained, the employees will not get Insurance coverage for the enhanced premium paid. be accepted if theapplicant has already attained the age of 55 years on the date of submission of his application, notwithstanding the fact that the amount was already deducted in the monthly pay bills. Such amounts shall be treated as unauthorized amounts and refunded to the individual following the usual procedure. d) An employee who is already a subscriber of the Fund but is aged above (55) years cannot increase the Premium for additional Policies. However, in respect of those employees, recovery shall continue at the existing rates of Premium for the existing policies till the original date of maturity of the said policies (Last Premium due). e) The minimum term of Policy should be (5) years i.e., Maximum age at entry shall not be more than (55) years. f) The 'Sum Assured Table' issued in the G.O. first read above be replaced by a new table Annexed to this order. The Director of Insurance, Andhra Pradesh shall take necessary action in this regard. g) The Sum Assured table Annexed to this order shall be reviewed at least once in every (5) years. The Director of Insurance, Andhra Pradesh shall take timely action in this regard. h) Necessary amendments to the Andhra Pradesh Government Life Insurance Fund Rules shall be issued separately. 8. These orders shall come into force with effect from 01.04.2016 and the above revised premium rates shall be recovered from the pay of March, 2016, payable on 01.04.2016. 9. The Drawing and Disbursing Officers concerned are solely responsible for effecting the recovery of revised premium from all the eligible employees (i.e. who are below 55 years of age) from the pay of March, 2016 payable in April 2016 duly forwarding the requisite proposal forms and obtaining the requisite policies from the Insurance Department intact. If the fixation is delayed for any reason, the premium shall be recovered only from the month of drawl of pay fixation arrears and in such case, no arrears of premium shall be collected. 10. To ensure proper implementation of the Scheme, the HODs / DDOs are requested to follow the above instructions scrupulously. 11. The Director of Treasuries and Accounts, A.P., Hyderabad and the Director of Works Accounts, Andhra Pradesh shall issue suitable instructions to all the District Treasury Officers/Treasury Officers/ Pay & Accounts Officers under their control, to ensure that the above revised premium rates with reference to new pay slabs are implemented from the pay of March, 2016 payable on 1.4.2016 and ensure cent percent coverage of eligible employees under Andhra Pradesh Government Life Insurance Scheme. The District Treasuries and Sub-Treasuries / Pay & Accounts Officers (works), and the Pay and Accounts Officer, A.P., Hyderabad should verify the collection of premium as per the slab rates before passing the salary bills. 12. The Director of Insurance, Andhra Pradesh, shall ensure that policies are issued to all the subscribing employees expeditiously after the applications are received in his department duly following the normal procedure. 13. All the Departments of Secretariat / Heads of Departments are requested to issue suitable instructions to their subordinate offices to ensure that all eligible employees are brought under the Andhra Pradesh Government Life Insurance Scheme. ENDOWMENT ASSURANCE POLICY MATURING AT THE AGE OF (60) YEARS(WITH PROFITS). Age next birth day at entry in Years Sum Assured Rs.